Dwarf varieties of evergreen trees originate in various ways: crossbreeding of cultivars by plant developers, grafting onto a dwarf rootstock or, naturally, through evolution in harsh climate or soil conditions. The miniature evergreen specimens are not only ideal for small yards, they maintain their beauty of your landscape while other trees are dormant. Dwarf evergreens provide year-round protection and habitat for birds and other wildlife too, and, in some cases, provide berries for their sustenance, encouraging them to visit your yard. A view of a botanical garden with evergreen trees. A group of small confiers grow in a greenhouse. When imagining a dwarf evergreen, you probably picture a Christmas tree small enough to fit in a house. Conifers comprise a plant group with one of the largest collections of dwarf cultivars. Whether it is in the shape of a narrow spire, a pyramid or a roundish mound, a needled evergreen adds interest to the landscape. Plus, the diminutive size and slow-growth pattern of dwarf conifers makes them easy to transplant, if you are not pleased with their original placement. In U.S. Department of Agriculture plant hardiness zones 2 through 6, a dwarf Alberta spruce (Picea glauca albertiana "Conica") can offer entranceway charm. 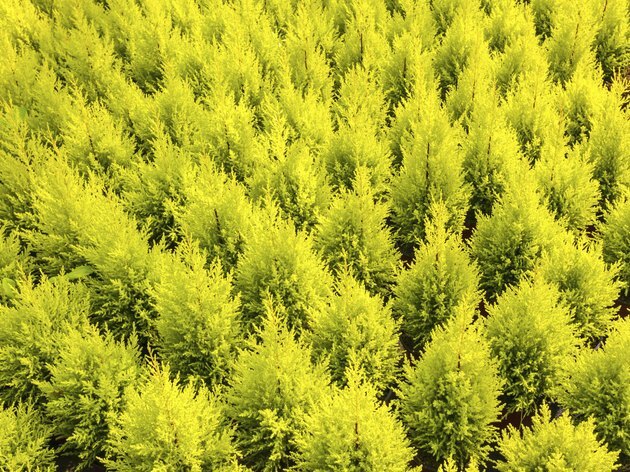 The "Golden Mop" sawara cypress (Chamaecyparis pisifera "Golden Mop") is another favorite in USDA zones 4 to 8. Featuring blue-gray foliage, the compact white fir (Abies concolor "Compacta") thrives in USDA zones 5 to 10. 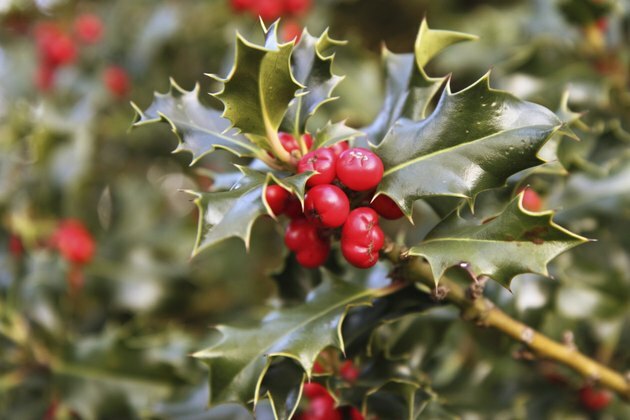 A close up of a holly bush. Other evergreens, typically associated with hedges, include privet, boxwood and hollies. Boasting late-summer flowers, followed by berries, a dwarf Japanese privet (Ligustrum japonicum "Rotundifolium") will flourish in USDA zones 7 to 10. The popular dwarf boxwood (Buxus microphylla "Winter Gem") puts on a bronze tint during the cold months in USDA zones 5 to 9. Two hollies that combine attractive foliage with winter berries, inkberry (Ilex glabra "Shamrock") and Japanese holly (Ilex crenata "Convexa"), grow to only 5 feet tall. "Convexa" thrives in USDA zones 6 to 10, while "Shamrock" will grow in these zones, and also USDA zone 5. A meyer lemon gros on a tree in the sunlight. Plant breeders have grafted a number of citrus trees onto dwarf rootstocks to produce varieties that can be cultivated as indoor plants or patio trees. In USDA zones 8 through 11, they can also be planted outdoors. 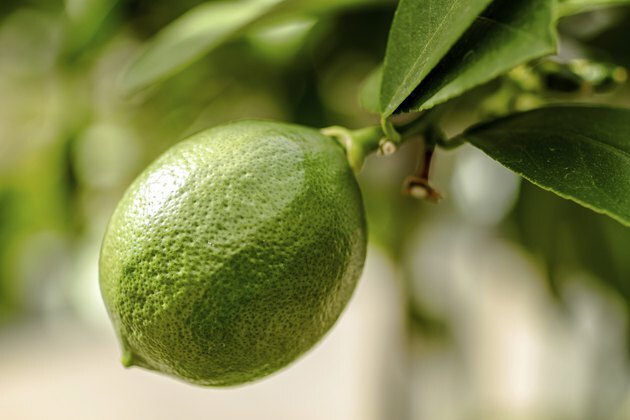 Favorite dwarf citrus include Meyer lemon (Citrus limon "Improved Meyer"), Persian lime (Citrus latifolia "Bearss") and satsuma mandarin (Citrus unshiu). Not merely decorative, these small trees produce fruit indoors or out. Some bear fruit throughout the year. 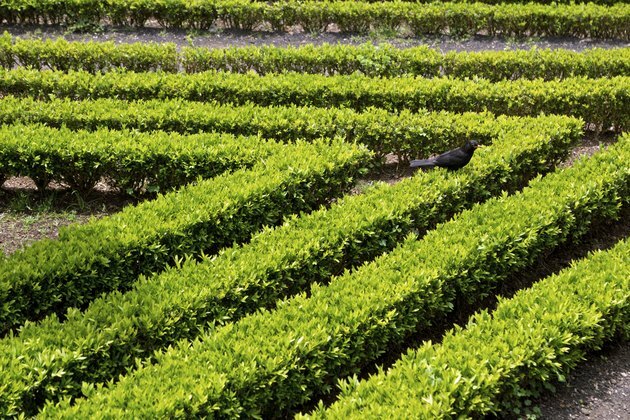 A large arrangment of boxwood shrubs in a botanical garden. Because of their stability, use dwarf evergreens to anchor mixed plantings in beds or borders as perennials, annuals and deciduous plants come and go with the seasons. One landscape designer advises that compact evergreens should make up 50 percent of foundation plantings. 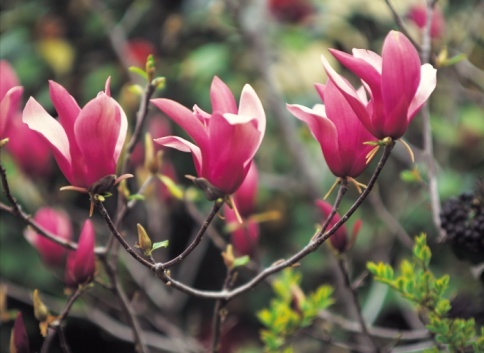 Do not locate your plants closer than 1 foot beyond the tree's mature spread and the house, though. Many of the traditional hedge plants excel in informal screens, too. 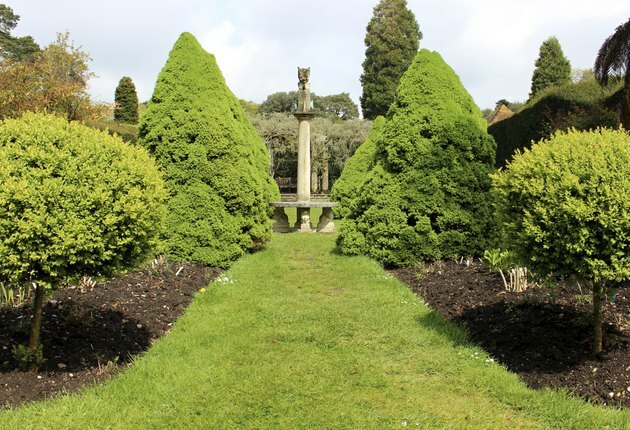 Especially suitable for boxwood and some conifers, such as junipers, is cutting them into topiary shapes or spirals, either in the ground or growing in pots.